Wine expert Jennifer Simonetti-Bryan is here to tell you everything you need to know about the latest craze to conquer the wine world. 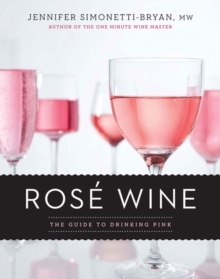 Rose and rosado wines come in a whole range of styles: from pale pink to copper, bone dry to summer sweet, light and delicate to full and rich. In this fun, informative guide, Jennifer offers an enlightening history of the style, explains how it's made and surveys the countries and regions producing it today. Take her quick and easy wine quiz to determine which style is right for you - blush, crisp, fruity or rich - then consult her signature 'Wine Wheel' to find out which wines you'll like best. Each of the four style categories feature a comprehensive overview and full information about the bottles you need to try, tasting notes, pricing and food pairings.